Can Tai Chi Improve Your Health? Can tai chi improve your health? Proponents for this ancient practice suggest that it can, and a recent Mayo Clinic article Tai Chi: Improved Stress Reduction, Balance, Agility for All seems to support this claim. 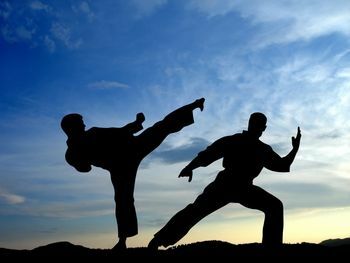 The martial art offers many benefits for a person’s mind and body. What is tai chi? The program is a form of martial art that incorporates mind-body exercises in its techniques. The individual has an opportunity to improve health, mental functioning and overall wellbeing using the “moving meditation”. This approach is excellent because it helps you become balanced with heightened awareness of your body. Tai chi was originally developed as a way for a person to defend him or her self. However, the process has been associated to healthful benefits. The program enlists opposing forces in the body known as the “yin” and the “yang” along with “qi”, which is the body’s energy force. The process calls to the environment as well. The posturing in tai chi is named after animals and elements of nature. This helps the individual to develop deeper self-awareness through awareness of his or her surroundings. Meditation is part of the process as well. It is necessary to remove stressful thoughts as you follow the movements. The idea is to used relaxed focus in order to build awareness of nature, including body awareness. Body awareness is an important facet of heath and well being that is commonly overlooked. Body awareness involves harmony and balance that exists on a conscious as well as a subconscious level. In many instances, a person can lose touch with the body, often ignoring signs that attention is required. Overeating is a prime example of lack of body awareness. People may overeat out of sheer boredom, emotional reasons or poor habit rather than according to their bodies’ signals of hunger. Over time, the individual no longer notices feelings of hunger unless they are extreme. In addition, the problem can involve eating when full. The signals for fullness have been ignored so long that the person is out of touch with them. Several approaches offer increased body awareness. Biofeedback is an example that works for many people but tai chi may be an approach that is more convenient for many. The process is excellent because it helps develop strength, relaxation, and improved body awareness. Many people have adopted this ancient approach to improving health over time with great success, and scientific studies are exploring the effects of tai chi on the body. The research is focused on how the martial arts practice effects health and how it can help alleviate certain medical conditions. In addition, researchers are exploring chronic diseases that the approach can treat. Before adopting tai chi into your treatment plan, discuss the option with your physician. As for now, the martial arts practice is not designed to treat any specific medical condition. However, with approval from your healthcare provider, you may find that the process offers excellent benefits.